Are you interested in finding out more about the largest choir in the Civil Service? Perhaps even consider joining them? 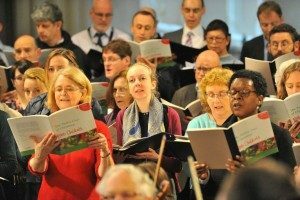 The London-based choir Etcetera has over 120 members and has raised nearly £25,000 for its favourite charities, which include the Civil Service Lifeboat Fund. The name originated from the founding departments - Environment, Transport and Communities - but membership is now open to all. Each year the choir gives several public concerts; performances include concerts at the prestigious St John’s Smith Square, with an orchestra and capacity audiences of over 700. It was absolutely magnificent, exhilarating and unexpectedly emotional. I have never been so proud of something I have done - a truly life-enhancing experience. The team spirit is the best part of being in Etcetera – we build each other’s confidence, we are united by a common goal and every rehearsal and concert brings a fantastic sense of achievement. The choir rehearses on Monday lunchtimes in Westminster; please do visit their webpages to find out more including their upcoming programme, and how you can get involved.